Pattaya is located on the Gulf of Thailand, southeast of Bangkok and 1 hour drive from Suvanabhumi International Airport. From a fishing village in the 1960's, Pattaya has emerged as one of the favourite Thailand golf vacation destinations. Pattaya has over 30 golf courses of which all are accessible to golf visitors. The best courses include Siam Country Club and Laem Chabang. After golf, it's time for you to explore the infamous nightlife of exotic Pattaya, the resort which never sleeps! Siam Country Club – Plantation Course Siam Country Club Pattaya Plantation opened in April 2008 and was designed by Lee Schmidt of Schmidt & Curley. The Plantation is a 27-hole golf course and fairways, bunkers and greens are uniquely different from any other golf courses in Thailand. The routing sits high on rolling hills of the natural terrain meandering mountains and natural creeks with a panoramic view of Pattaya. Siam Country Club Pattaya Old Course is the first privately owned golf club in Thailand, originally designed by I. Izumi. The golf course opened in 1971, and had hosted the Thailand Open 4 times together with many Asian Golf tournaments. The golf course and clubhouse underwent a complete renovation in 2006, and opened in March 2007. Despite a new look, the Old Course remains a classic traditional tree line course with many fond memories of the past. Classic, beauty, and challenge are what the Old Course is known for today in Thailand. Just like the golf course, the clubhouse also had a 100% complete refurbishment. The restaurant, overlooking the 18th hole enjoys spectacular view of the golf course and is the best place to be at the end of the round. Shortly after the Old Course was opened in March 2007, it hosted a world class tournament, Honda LPGA Thailand. Since 2010, the Old Course has become home of the LPGA tournaments. Events such as the LPGA are testimony to the quality of the golf course, clubhouse, and services. In May 2014, Siam Country Club launched a new golf course project in Thailand, Siam Country Club Pattaya Waterside. The Waterside features water front golf course concepts, and will hold the same championship qualities of the successes of the Old Course (18-hole) and Plantation (27-hole) which are already renowned golf courses among the best in Asia Pacific. The course was designed by IMG Golf Course Design, one of the world renowned golf course architects and expert in world sport and event managements. Strict environment cares, aesthetic beauty, challenge and friendly play are the emphasis of the Waterside design with the absolute distinct differences from the famous Old Course and Plantation. A highlight of the Waterside course is the clubhouse with 180 degree view of the beauty of the course, lakes, creeks and landscape blending with natural surroundings. At Laem Chabang, everyone enjoys the feeling of being close to nature in this lush and exotic course designed by famed golfer, Jack Nicklaus. This world-class golf course consists of 27 holes on 700 acres and each hole is different depending on its environment. The Mountain 9 is designed around the beautiful mountain style hills; the Lake 9 has a stream running through it, and the Valley 9 is surrounded by picturesque mountains. These nature conditions have been created to offer the golfer a challenging golf course for each to try their particular skills and ability. Laem Chabang has modern and stylish facilities including restaurants, bars and locker rooms. Stay in the heart of Central Pattaya, where you're only a short walk away from beachside bliss or some serious shopping. Centara Pattaya Hotel will be your calm oasis within the all-action resort town of Pattaya, one of Thailand’s most eclectic destinations, where dining, shopping and golfing opportunities are all around you, and every form of land or water sports are available. You'll also get a thrill out of the city's vibrant nightlife. Another way you can relax or revive is to lay back beside the pool and then drift into our spa. 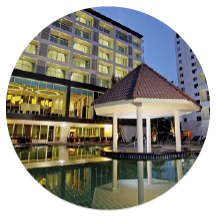 And then at night, you will be able to return to the accommodation that suits your individual circumstances, as Centara Pattaya Hotel offers a range accommodation styles that includes deluxe rooms and suites.